For women, leather jackets are a faultless way to finish a glance. Explore a big selection of bomber jackets and traditional leather jackets with William Jackets. These jackets are lukewarm, gratifying and a perfect addition to any outfit. With comfort, warmth, and fashion, they're perfect yr-spherical wear. Find out leather jackets with high-quality textural factors. Go together with polished leather-based or suede and choose button, zipper or buckle detailing to add flair. Colored leather-based jackets are an amazing way to add a unique touch to an outfit. Easily match extraordinary colorings to any ensemble. Use a shade as a suggestion and pick out up different exceptional accessories to create an entire look. Accompanying leather-based footwear or a purse will create a unique, pulled-collectively look. William jackets introduce Women’s Quilted Brown Moto Leather Jacket. This jacket is made up of top quality faux leather. It has comfort lining inside the jacket that will keep you warm in cold temperature. Its fully qualified patterns make it more unique than any other kind of a leather jacket. Women’s Quilted Brown Moto Leather Jacket featured in brown color with rib-knitted collar, cuffs, and hemline. 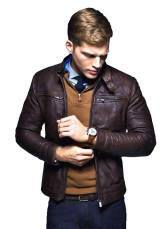 Brown Moto Leather Jacket is an all-purpose leather jacket that can be used in any kind of function or party. You will feel comfortable while wearing this stylish jacket.For men, William jacket introduces the Men Bomber Red Leather Jacket. In order to be replaceable, you should have to be different in your looks. Your dress selection must be elegant. This Men Bomber Red Leather Jacket is made up of real high-quality leather material with viscose lining inside. It has stood up collar with front zipper closure. It has two bomber pockets on chest. It looks more unique due to its Blood red color. This jacket will make you prominent in gathering. Alex Wilder Runaways Rhenzy Feliz Green Bomber Jacket is one of the most favorite bomber jackets of customers. This jacket is made up satin fabric with soft viscose lining inside the jacket. It has Detachable Hoodie. It has a full zipper closure, full-length sleeves, rib-knitted cuffs. It has a greenish color that will provide you a glamorous look. Being well-dressed has not much to do with having good clothes. William jackets help you to select the good clothes as the joy of dressing is an art. Men’s Red Quilted Faux Leather Bomber Jacket is one of the most sold out bomber jackets. This jacket is made up of faux leather. It has an inviting feel, provides exceptional durability and quality with age. It has viscose lining inside the jacket. It has a rib-knitted collar, front zipper closure, rib-knitted cuffs. Men’s Red Quilted Faux Leather Bomber Jacket is unique and stylish due to its red color. So, just browse William jackets.com and don’t miss the Pilot A-2 Leather Men Brown Bomber Jacket, Back To The Future 2 Marty Jacket, Daniel Craig Spectre James Bond Austria Jacket, and Chris Pratt Jurassic World Grey Bomber Jacket.